Happy Holidays! I’m so excited to announce my special giveaway with TEMPTU, a popular celebrity airbrush makeup system. TEMPTU’s Airbrush Makeup Kit and patented AIRpod makeup is the first easy-to-use, professional-quality, home airbrush makeup system. Finally, every woman can easily achieve flawless makeup application like her favorite celebrities, every time. From Hollywood to Fashion runways, TEMPTU is the perfect at-home solution for women who want to look Red Carpet ready, but don’t have access to a professional makeup artist. I absolutely adore my TEMPTU Airbrush Makeup system. It's my must use beauty tool in preparation for big events and parties. It's very simple to use and extremely effective. All I have to do is insert the foundation shade and move the applicator 4-6 inches away from my face in a circular motion. It usually takes me under 10 min to achieve a flawless porcelain skin look. One of my lucky readers will have a chance to win the above TEMPTU Signature Airbrush Makeup Kit (system, foundation, blush, highlighter). Please enter through RAFFLECOPTER below. Good luck! 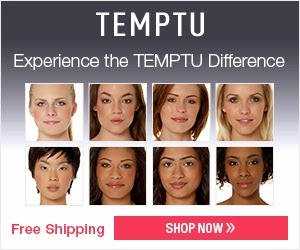 This Holiday giveaway was sponsored by TEMPTU.